CNC-specific Smad2 deletion associates with decreased Smad2/3 phosphorylation in the aortic root of Tbr1MR/+ mice. 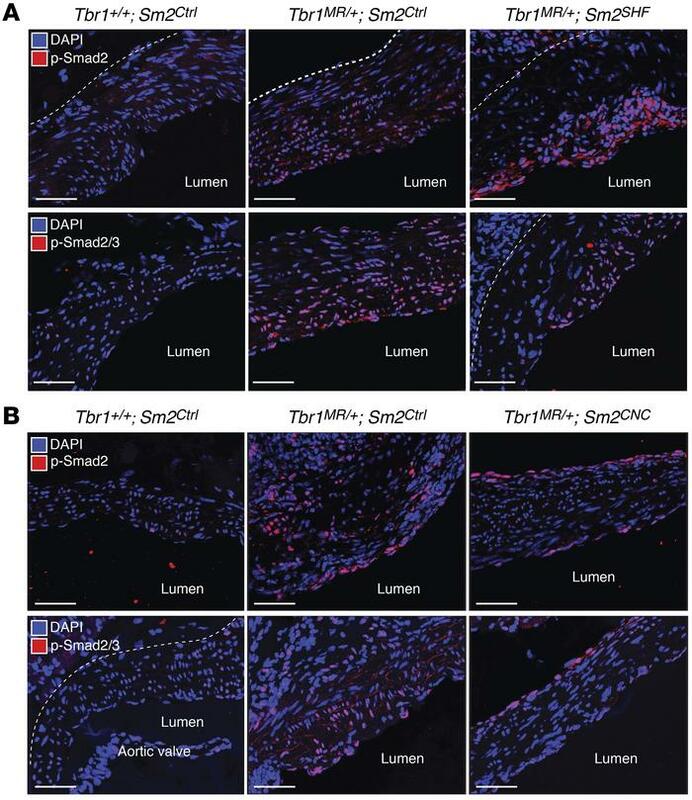 (A) Representative immunofluorescence (IF) images of the aortic root of 20-week-old control mice (Tbr1+/+; Sm2Ctrl), mutant mice in which Smad2 is not deleted (Tbr1MR/+; Sm2Ctrl), and mutant mice in which Smad2 is deleted in SHF-derived cells (Tbr1MR/+; Sm2SHF) stained with an antibody that recognizes p-Smad2 or p-Smad2/3. Dotted lines mark the outer boundary of the vessel wall. Experiment was conducted at least 3 times. Image enhancement for visual display was applied uniformly to all panels. (B) Representative IF images of the aortic root of 20-week-old control mice (Tbr1+/+; Sm2Ctrl), mutant mice (Tbr1MR/+; Sm2Ctrl), and mutant mice in which Smad2 is deleted in CNC-derived cells (Tbr1MR/+; Sm2CNC) stained with an antibody that recognizes p-Smad2 or p-Smad2/3. Scale bars: 50 μm. Experiment was conducted at least 3 times. Image enhancement for visual display was applied uniformly to all panels.